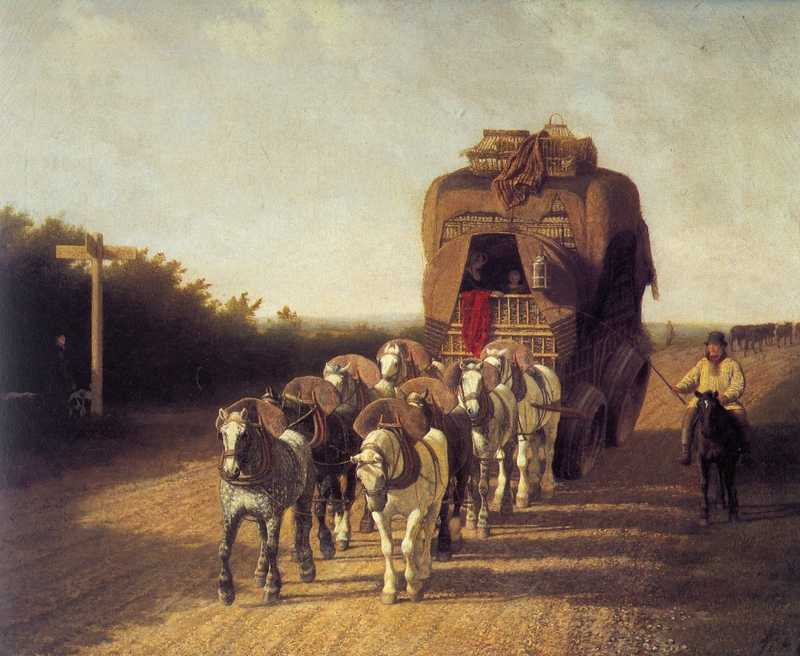 The heavy goods wagon is also called ‘fourgon’ and is meant to transport a large amount of goods over a long distance. Here we see the regular service between London and Ludlow, a distance of about 228 km. This trip probably took four days. Even some passengers ride between the goods. The beautiful team of eight horses is not driven from a box seat on the wagon but by a separate rider. He rides a small horse without stirrups next to the wagon and has a long whip. The wagon has very broad wheels with a special shape to avoid sinking in the mud or sand. All horses are greys and carefully selected. They carry a round bag on top of their harness, maybe containing a blanket. Agasse was a very able animal painter and he also had a good eye for this special team and their wagon.